When Australian amateur astronomer Nicholas Brown photographed a region in the constellation Monoceros in early January 2002, he noticed a 10th-magnitude star that wasn't there when he had photographed the same area about two weeks earlier. Over the next month, amateur and professional astronomers worldwide watched as this "new" star brightened to magnitude 6.5 and then faded away again. Now a meager 16th-magnitude star, V838 Monocerotis (V838 Mon) was for a short time intrinsically brighter than any other star in our entire galaxy. A few weeks after Brown's discovery, astronomers noticed that V838 Mon was surrounded by an expanding glowing cloud. On October 2, 2002, NASA's Astronomy Picture of the Day (APOD) announced another "mystery star": "Observations indicate that the erupting star transformed itself over a period of months from a small under-luminous star a little hotter than the Sun, to a highly luminous, cool super giant star undergoing rapid and complex brightness changes. The transformation defies the conventional understanding of stellar life cycles." [Italics added.]. --typical of a cool super giant star. But seven months later, it was much cooler. "It corresponded to a surface temperature little more than 1,000 Kelvin, well within the temperature range of brown dwarfs," says team member Mark Rushton of Keele University in the U.K. In the Electric Universe view, it's also significant that V838 Monocerotis is a binary pair. Binary pairs are not unusual. In fact, more than half of all stars have one or more companions. Because the stars are far apart and chance encounters are rare, this observation suggests that there must be something in the process of a star's birth or evolution that favors the formation of multiple stars. One possible electric mechanism is fissioning of a nova. The electrical stress of a star is concentrated on its surface. If there is more stress than the star can take, one response would be for the star to fission into two stars. The surface area of two stars is greater than the surface area of one, so the new system is able to accept more electrical stress. 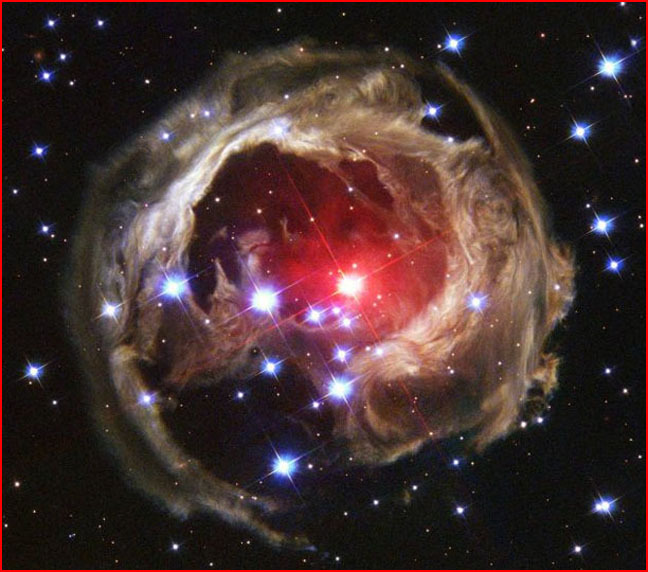 V838 Monocerotis has all the basic characteristics of fissioning to relieve electrical stress: nova-like brightening followed by loss of luminosity and loss of temperature; changing to a different spectral type with marked changes in its surface chemical composition; discovery of a binary companion; and the appearance of an expanding nebulous cloud. If stars are powered by electrical current filaments strung through the galactic plasma in which the stars are immersed, power surges in those circuits can suddenly brighten and dim them. The interiors of the stars will bear little resemblance to the presently accepted model based on the assumption of a thermonuclear core. The electrical generation of starlight explains the many anomalies that remain intractable to theories from the gaslight era of astronomy.